8pcs 4 Sizes Pompon Set Plastic Pom Pom Maker Clover Fluff Ball Weaver Needle Craft Knitting Tool DIY Sewing Tools Color Random. All you need are yarn, string and scissors to complete your pom-pom and fluff balls. Knitting Kits Easy Knit Kids Wool Toys. One 6 Cross Knitting Set. One 24 Cross Knitting Set. Let children create their own wool toys with Easy Knit Kit. 1 x Crochet Hook. Easy Knit Set. Length: 80cm. 18 Pcs x Knitting Needles. Material: Carbonized Bamboo. Quantity 18 different sizes. 18 different sizes . Included: 1set X Stainless Circular Knitting Needles. Material: Stainless Steel. Quantity: one set including 11 pcs( 11 different size). 1.5mm/1.75mm/2.0mm /2.25mm/2.75mm/3.0mm/3.25mm/3.75mm/4.0mm/4.5mm/5.0mm/(UK6--16). Deborah Norville: Fixed Circular Needles. Deborah Norville needles have you covered with a full range of knitting needle and crochet hook sizes and styles. Beautifully dyed wood surface warms up quickly in your hands. Quantity: 18 Pcs (18 different sizes). Color: As the picture shows. Note: Due to the difference between different monitors, the image may not reflect the actual color of the item. This set is including the 18 sizes. Material: Carbonized Bamboo. Quantity: 18 Pcs (18 different sizes). Color: As the picture shows. Note: Due to the difference between different monitors, the image may not reflect the actual color of the item. One 6 Cross Knitting Set. One 24 Cross Knitting Set. 1 x Crochet Hook. EASY KNIT BEAR. Different colours of Wool. Stick on facial features and one bag of polyester stuffing. Good for weaving and sewing up seams on your knit & crochet projects. 18pcs Weaving needles. Colorful and useful for your knitting work. Color: As is shown in the pictures. 13 Pairs aluminium circular knitting needles in the following different sizes: 2.75mm, 3.25mm, 3.5mm, 3.75mm, 4.0mm, 4.5mm, 5.0mm, 5.5mm, 6.0mm, 7.0mm, 8.0mm, 9.0mm,10.0mm and 4 plastic wire sizes include:32cm,38cm,42.5cm,55cm. 1 set (4 sizes) fluff ball weaver. Easy to make the knitting with the instructions. Creates the best and funny work with the excellent knitting loom. Color: as pictures. 2.Non-defective and Right Products. 4 Circular Plastic Wires. Good gift for your mom, female friends who love knit needle DIY handmade. Nice color and lovely appearance, the more you knit with them,the more you will love to knit. 13 pairs Aluminum Needles. 10 Different sizes from no7 down to no16 length from 100mm to 140mm and from 3mm thick down to 1mm. Knitting made easy for children 6 to 10. 11 Sizes 43 cm Circular Crochet Knitting Needle Set. Each circular needle attached with a Chinese needle gauge and a big eye sewing needle for stitching the joint. 1 Set Crochet Knitting Needle(11 pcs). Set of 18 of 40cm length bamboo knitting needles. 2mm, 2.25mm, 2.5mm, 2.75mm, 3mm, 3.25mm, 3.5mm, 3.75mm, 4mm, 4.5mm, 5mm, 5.5mm, 6mm, 6.5mm, 7mm, 8mm, 9mm, 10mm. 4 Circular Plastic Wires. Good gift for your mom, female friends who love knit needle DIY handmade. Nice color and lovely appearance, the more you knit with them,the more you will love to knit. 2 Extend Connect tool. UK 13 Sizes Interchangeable Aluminium Circular Knitting Needles Set 2.75mm-10mm. 13 Pairs aluminium circular knitting needles in the following different sizes: 2.75mm, 3.25mm, 3.5mm, 3.75mm, 4.0mm, 4.5mm, 5.0mm, 5.5mm, 6.0mm, 7.0mm, 8.0mm, 9.0mm,10.0mm and 4 plastic wire sizes include:32cm,38cm,42.5cm,55cm. Material: Carbonized Bamboo. Color: As the picture shows. Quantity: 18 Pcs (18 different sizes). Note: Due to the difference between different monitors, the image may not reflect the actual color of the item. Material : Carbonized Bamboo. Length : 15.7" ( 40cm). 2.0mm / 2.25mm / 2.5mm / 2.75mm / 3.0mm / 3.25mm / 3.5mm / 3.75mm / 4.0mm / 4.5mm / 5.0mm / 5.5mm / 6.0mm / 6.5mm / 7mm / 8mm / 9mm / 10mm. 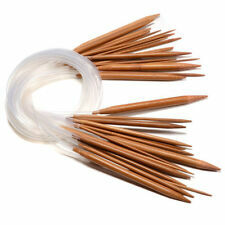 18 pcs bamboo circular knitting needles in the following different sizes: 2.0mm, 2.25mm, 2.5mm, 2.75mm, 3.0mm, 3.25mm, 3.5mm, 3.75mm, 4.0mm, 4.5mm, 5.0mm, 5.5mm, 6.0mm, 6.5mm, 7.0mm, 8.0mm, 9.0mm, 10.0mm. Material: Carbonized Bamboo. 18Pcs x Knitting Needles. Note: Due to the difference between different monitors, the picture may not reflect the actual color of the item. Also note that monitor settings may vary from computer to computer and may distort actual colors. Material: Alumina and PVC tube. This set of 11 sizes superior quality circular knitting needles. Nice needles with smooth finish. The more you knit with them, the more you will love to knit. 11 pcs circular knitting needles in the following different sizes: 2.0mm、2.5mm、3.0mm、3.5mm、4.0mm、4.5mm、5mm、5.5mm、6mm、7mm、8mm. Crochet Tube Set Carbonized 18 Tools Circular Sizes Knitting Needles Bamboo 16"
Material:Carbonized Bamboo PE Tube. 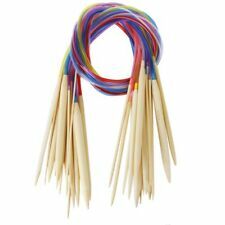 18 Sizes 40cm Multicolor Tube Crochet Knitting Needles Set. 1 Set Knitting Needle(18pcs). A good weave tool for you. Made of soft m ulticolor tube and c arbonized b amboo,durable and easy to use. 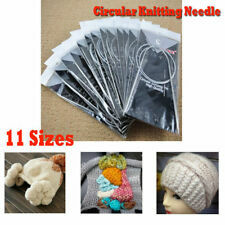 11 Sizes 80 cm Circular Crochet Knitting Needle Set. Ideal for knitting neck bands in rounds,as these will fit in a pocket/bag better than those straight needles. 1 Set Crochet Knitting Needle(11 pcs). This set of 11 sizes superior quality circular knitting needles. Nice needles with smooth finish. The more you knit with them, the more you will love to knit. 11 pcs circular knitting needles in the following different sizes: 2.0mm、2.5mm、3.0mm、3.5mm、4.0mm、4.5mm、5mm、5.5mm、6mm、7mm、8mm.